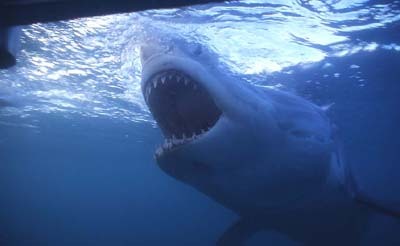 South Australia is home to the Great White Shark and where we capture rare and dramatic footage of this wonderful creature. It's true, Great White Sharks have a reputation of being the world's most feared and terrifying predator. However, their reputation is mainly based on ignorance and a lack of experience when working with these magnificent animals. 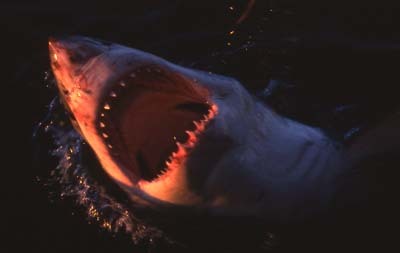 Great White Sharks are one of the most beautiful and awe inspiring animals living in the worlds oceans. The media is responsible for much of the hysteria surrounding shark attacks but did you know your family pet is probably more likely to kill you that a shark. Check out the graph on this page as an example of the how unlikely you are to be killed by a shark. 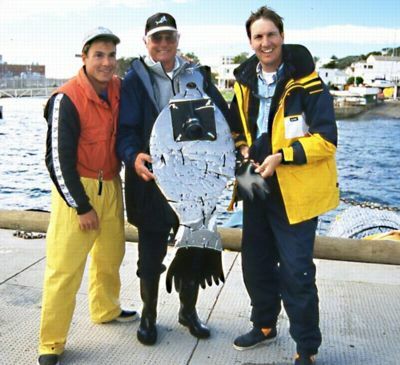 This dead Great White Shark was killed by an amateur fisherman simply for sport. 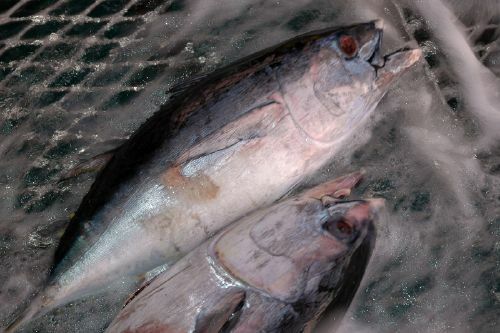 You can clearly see the Ampullae of Lorenzini in this shot. 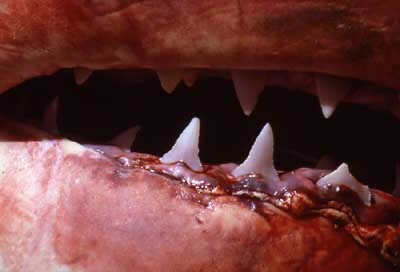 Sharks have several rows of teeth and as teeth fall out or are broken off they are rapidly replaced. The Great white shark is a highly adapted predator and their mouths have up to 300 serrated, triangular teeth arranged in several rows. Sharks have an exceptional sense of smell to detect prey. 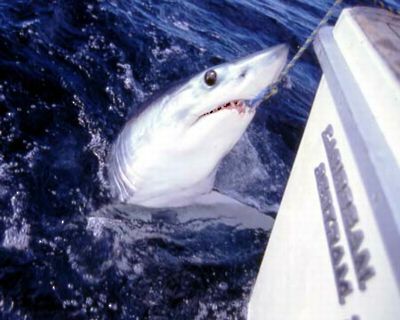 Great White Sharks predominantly feed on pelagic fish such as Tuna, Snapper and Yellowtail. 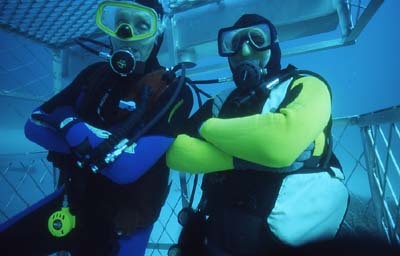 They also feed on other sharks and stingrays, scavenge dead fish and whales and actively hunt seals and sea lions. 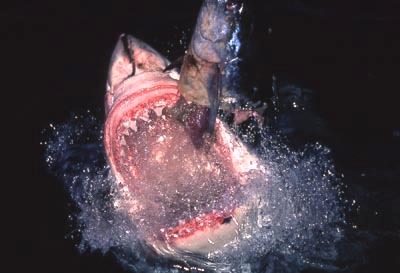 Humans are not hunted by sharks, but sharks are opportunistic feeders and with more people entering the shark's environment with their leisure activities, some people have come in contact or been attacked by Great White Sharks. The ocean is their home and humans who like to play in it must understand that. 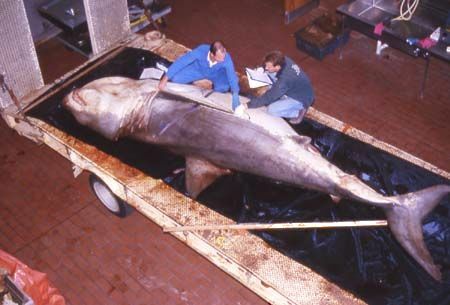 The Great White shark is a so called an "Apex Predator" at the top of the marine food chain and as such is threatened by a few other species, including man. Shark populations around the world are under enormous pressure from humans and world shark numbers have fallen dramatically in recent years. The Great White shark is a slow breeding shark and has been listed as a threatened species due to this population decline. The drop in numbers seems to be a direct result of commercial fishing, accidental kills and trophy hunters cashing in on the general hysteria surrounding sharks. To help stop this population decline of the Great White Shark, it is now a protected species in Australia, South Africa and other parts of the world. 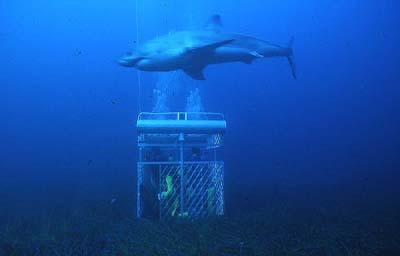 Remember, they are not taking our fish, humans are taking fish stocks away from the sharks. They are not our fish in the first place. 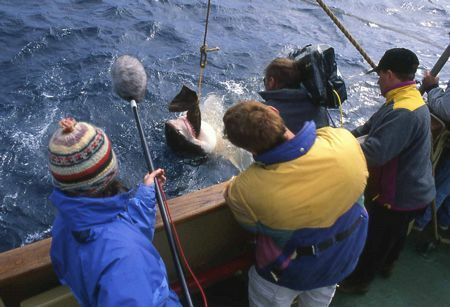 The Great White Sharks we film in South Australia are commonly over four meters (12 foot) long, with mature females usually much larger and heavier than the males. Many of these sharks have been tagged by researchers like Rodney and Andrew Fox, in an effort to gather more information on the movements of the individuals visiting our designated filming locations at the remote Neptune Islands. 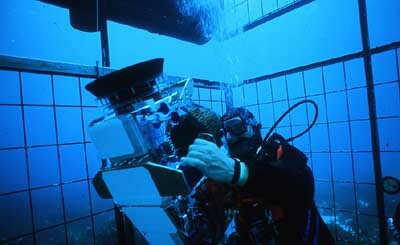 Andrew Fox has worked closely with the Great white Shark for over twenty years. Andrew Fox has been working closely with Great White Sharks since the first Shark filming and research expeditions began in South Australia. 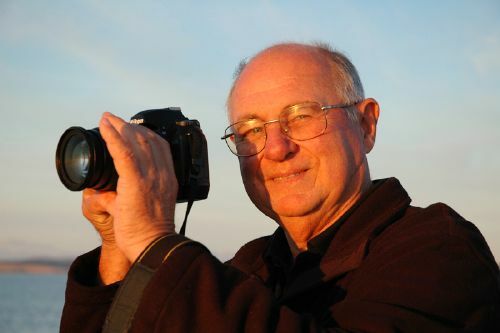 With a Biological Science Degree, Andrew currently runs shark research, observation and filming trips to the Neptune islands and has been studying the behavior of sharks off Australia's West Coast since 1979. 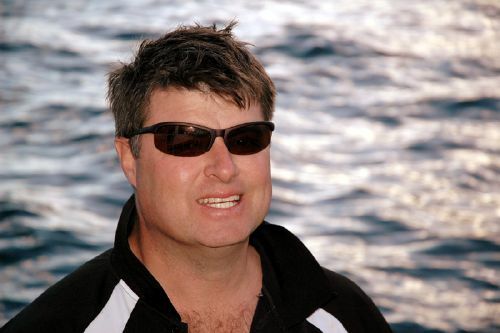 Based in Adelaide, Andrew and Rodney Fox together established the "Fox Shark Research Foundation" to identify individual sharks and research the number of White sharks off the southern Australian coastline. 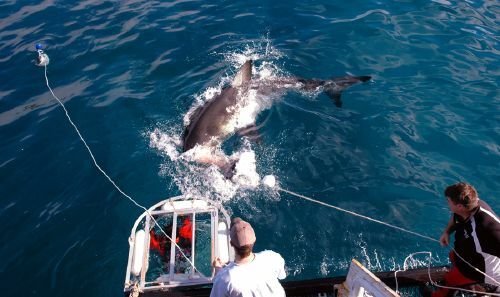 They maintain an extensive White Shark tagging program and their ongoing research contributes to the pool of information about this spectacular creature. 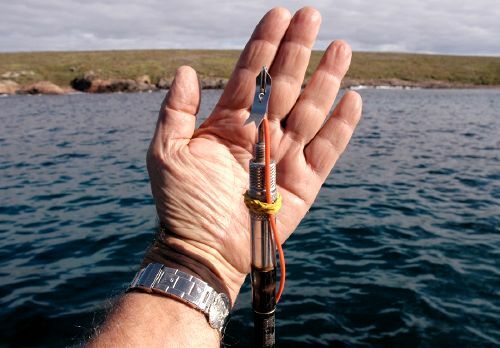 Rodney Fox was attacked by a Great White Shark at Aldinga Beach in South Australia during December 1963. 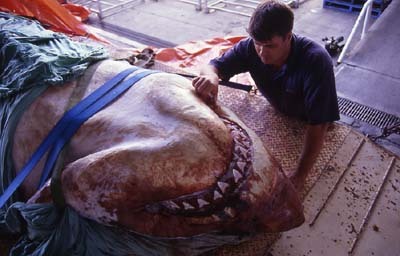 His attack is one of the worst shark attacks ever recorded and the details of that event have been endlessly documented. 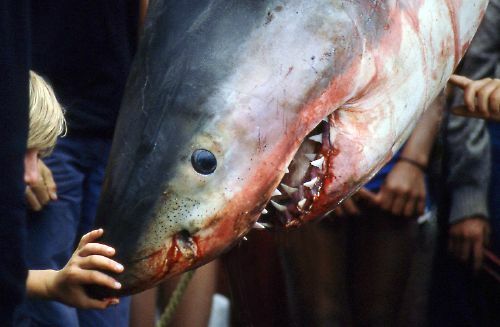 His story has become one the most famous accounts of survival from the jaws of a Great White Shark. 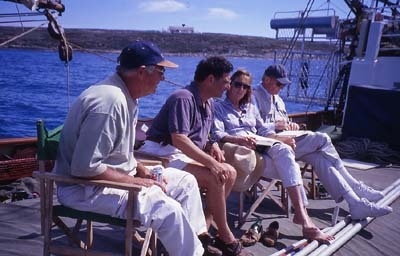 For over fifty years Rodney Fox has educated other people, organizations and governments about the need to protect sharks. 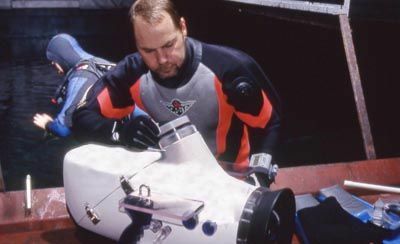 In the 1990's Rodney was one of the first people to speak up for sharks, and was directly involved in helping make the Great White Shark a protected species. 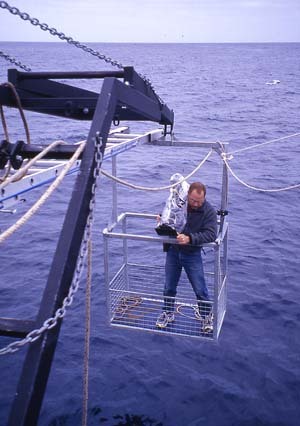 Legendary shark attack survivor Rodney Fox taking photographs to help identify sharks for scientific identification as part of the Fox research programme. 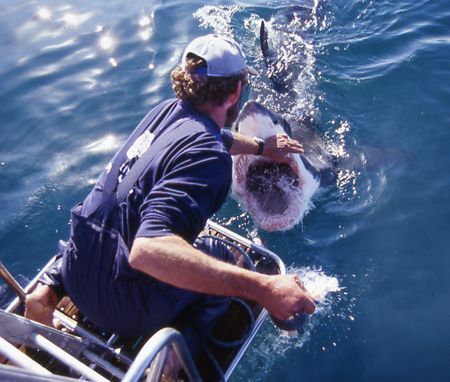 Both Rodney and Andrew Fox are regarded as world authorities on Australia's Great White Sharks and with over 40 years experience working with these animals they are committed to the study and conservation of the Great White Shark. 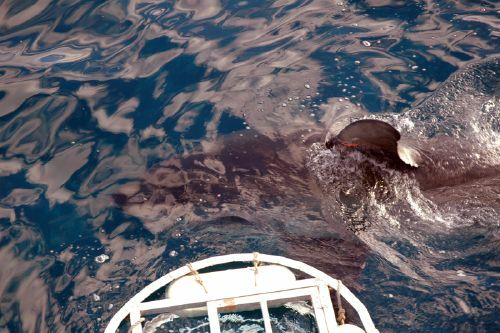 The Fox Shark research foundation has collected data on White sharks at the Neptune Islands for over 12 years to help define important habitat areas for white sharks.